As the grand finale of the 2018 FIM Supersport 300 World Championship season approaches, Ana Carrasco (DS Junior Team) and Scott Deroue (Motoport Kawasaki), first and second in the standings, respectively, are enjoying their final days of rest before the decisive moment. On Sunday they both face the biggest day of their careers so far, as one of them could become the WorldSSP300 champion. It’s been a long road to the top for both riders, but the WorldSSP300 championship battle is not the first time their careers entwine. Back in 2014, RW Racing GP announced the pairing of Carrasco and Deroue as their rider line-up for the Moto3™ season, with both riders picking up the KTM Kalex Moto3 for the first time. 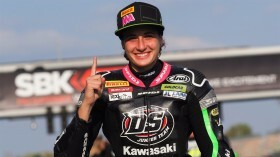 At the time, Carrasco had just turned seventeen and was coming off a promising first season in the junior series, when she had become the first female rider since 2001 to score points in a GP race. Deroue in turn was barely eighteen and had raced three seasons in the Red Bull Rookies Cup, where he showed fantastic potential by taking several race wins and the overall runner-up spot in 2012. This was his first foray into the MotoGP paddock. This was a challenging season for the pair, who nonetheless managed to show glimpses of their potential while riding on difficult machinery. One season later however, they parted ways: Carrasco remained in Moto3 with RBA Racing Team, while Deroue moved over to the British Moto3 championship to hone his craft there, winning the title in his debut year. They won’t be the only Class of ’14 riders gunning for that title on Sunday however, as a teenage Luca Grunwald (Freudenberg KTM WorldSSP Team) was also learning the ropes on the Moto3 grid four years ago. Now all three – plus the younger Mika Pérez (Kawasaki ParkinGO Team) – find themselves one step away from making history at Magny-Cours. Relive the best moments from this year’s WorldSSP300 season and prepare for the final battle in France thanks to WorldSBK VideoPass. Deroue: "I will stay with the same team in 2019"